One of the appropriate ways of intensifying lupin production is to protect this crop against diseases and pests. Causative agents of lupin diseases are fungi, bacteria, viruses and nematodes, which cause different types of injuries: withering, decay, maculation, blotches, pustules, deformations, chloroses, etc. Losses in yield from diseases quite often reach 25-75% (Чекалин et al., 1981). Protection of plants against numerous diseases and pests by means of agronomic and chemical techniques is sometimes either not efficient enough, or economically unsuitable. Breeding of new resistant varieties is the most effective way to control losses in the yield. New lupin cultivars should combine immunity to fungal infection with resistance to viruses and bacteria. When studying disease resistance or selecting methods of analysis of breeding sources for resistance, it is necessary to know and to take into account biological and pathological features of pathogens. Such causative agents as phytopathogenic fungi belong to Phycomycetes (Peromospora, Phytophthora and Pythium), Ascomycetes (Erysiphe, Mycosphaerella and Dydimella), Basidiomycetes (Uromyces) and Deuteromycetes (fungi of genera Ascochyta, Septoria, Phyllosticta, Colletotrichum, Cercospora, Fusarium and Botrytis). The worst damage to lupin is caused by anthracnose, fusarium wilt, fusarium and other root rot, bacteria and viruses. Phytopathogenic viruses, mycoplasmas and mycoplasma-like organisms have been detected or are suspected in all leguminous crops. For lupin, especially harmful are widely spread viruses of mosaic. Phytopathogenic bacteria, mostly belonging to genera Pseudomonas and Xanthomonas, also afflict lupin plants frequently and severely. Lupin plants, and its low-alkaloid forms in particular, are infested by many species of plant-destroying insects, mites and nematodes. Subject to the variety, geographic and agronomic conditions, and the state of the population, many of these pests may manifest themselves by afflicting significant injury to the crop. Most of the parasitic species that affect fodder crops are represented by polyphagous forms, followed by the forms specializing on legumes. A small, but momentous part are oligophages with narrow specialization and monophages. 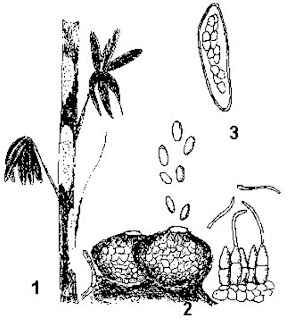 Parasitic forms accompany legumes all the time – from the planting up to the storehouse (Чекалин et al., 1981). The structure and quantity of the most notorious pests change during plant growth and development depending on the conditions of cultivation. If the plants had no resistance to pests, their inner resource of pest control, there would have been no yield. The problem to be solved by breeders is to use and enhance this resource. At the outset of the breeding process for pest resistance, such solution should rely upon the information on pest virulence, which obviously depends on the zone of cultivation. In order to solve the problem of resistance to pests, it is vitally important to know their biology, biotic cycles, and specialization. The agents of diseases and pests are known to play the role of a factor of selection in the evolution of lupin forms. Therefore, plant immunity becomes the main property of a healthy organism. Knowledge of the biology of disease agents is necessary for primary field estimation of the collection of lupin, and for selection of resistant forms. Most favorable conditions are found by the pests on susceptible forms where the pathogen is able to complete its biotic cycle before the host has reached maturity, which frequently leads to the loss of the plant. Resistant varieties, as a rule, interrupt the agent’s cycle, when the maturing periods of the host and the pathogen do not coincide. The analysis of host-pathogen interactions aids plant breeders to select the forms with true resistance, i.e. varieties resistant to an agent during the whole biotic cycle of a pathogen. Anthracnose (Glomerella cingulata (Ston.) Sp. et Schr., conidial stage such as Colletotrichum gloeosporiodes (Penz.) Penz and Sass., andColletotrichum acutatum Simm. and Simmonds). The agent belongs to the class of Ascomycetes, and the order of Sphaeriales. Anthracnose of lupin was reported first in 1939 on L. angustifolius L. (Sweetingham et al, 1998). Both acervuli of Colletotrichum gloeosporiodes and perithecia of the teleomorph Glomerella cingulata were described from stem lesions on infected plants (Weimer, 1952). Colletotrichum gloeosporioides is a species-level complex of morphologically related forms which infect a diverse range of plants. Significant variation in spore morphology and colony appearance exists and confusion with C. acutatum has occurred. DNA sequencing of isolates identified as C. gloeosporioides from lupins in the UK indicated greater homology to C. acutatum than C. gloeosporiodes(Sreenivasapprasad et al., 1994; Sweetingham et al, 1998). The disease is very harmful and introduces substantial threat to cultivation of lupin in countries with a wet climate. The disease causes peculiar spot on leaves, which is transfigured into pustules on stalks and pods. Mucous conidium can become active in the afflicted places after a rain. With drops of rain, the inoculum is diffused and infects adjacent healthy plants. The fungus can pass also on seed (Кривченко et al., 1975). The agent spends the winter together with postharvest crop residues, or in the form of microsclerotium, or in the form of fruit bodies developed in affected tissues. Perithecia contain asci with ascospores. The ascus is cylindrical, rounded on the top, and contains 8 spores. Ascospores leave the asci in spring and contaminate lupin plants. The disease is incited by a warm and wet weather. More detailed information on this disease is presented in the sections «Breeding Methods» and «Source Material for Breeding». 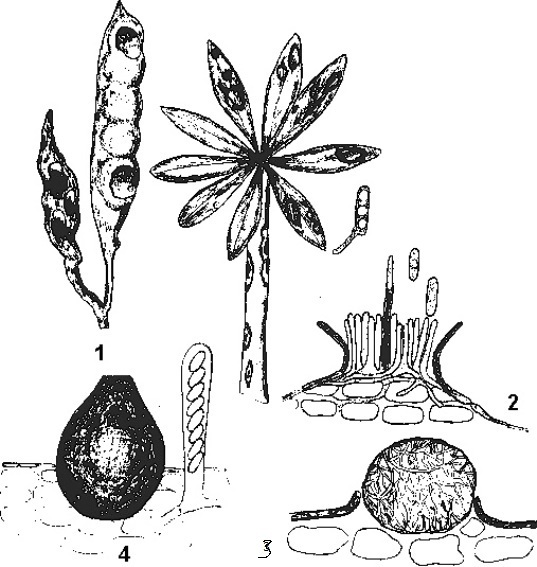 1 - characteristics of affection of lupin pods, leaves and stalks; 2 – conidial sporification; 3 - microsclerotium in plant tissues; 4 – sporification of a fungus (pheritecium and ascus with sclerotia). Fusarium wilt and root rot (F.oxysporum Schl., Fusarium avenaceum Sacc., F. roseum Lk.) The agents belong to the class of Beuteroraycetes, order of Moniliales, fam. Tuberculariaceae. These diseases are widespread in many countries, especially in Eastern Europe. Virulence is high, especially in combination with heat. Unstable water regime in soil also intensifies the course of the disease. Diverse forms of these diseases, and also the biotic cycle of the pathogen are presented here (Fig.41 in the book). Fusarium wilt (Fusarium oxysporum Schl. f. lupini Snud. and Hans.) caused by Fusarium vasinfectum was first described in 1906 in Germany (Pape, 1927), Sweetingham, 1986, 1989). Fig. 41. Fusarium avenaceum Sacc., F. oxysporum Schl. and F. roseus Lk. 1 - exterior of a diseased plant; 2 - decay of pods and seeds; 3 – grayish-brown ring in conductive vessels of a stalk; 4 - biotic cycle of the agent. The infection first becomes apparent in the vegetative stage as leaves begin to darken. Obvious symptoms begin at budding or flowering time when leaves wilt, desiccate and rapidly defoliate. At this stage, infected roots are almost symptomless except for a brown zone under the epidermis. Brown streaking of the vascular tissue is sometimes visible on the upper stem and, under wet conditions; pink spore masses develop from the vascular streaks. Infected plants eventually die (Kurlovich et al.1995). The existence of races of F. oxysporum f. lupini specific to different lupin species emerged from the surveys of Richter (1941). Arm­strong and Armstrong (1964) defined three races from Europian isolates of Fusarium oxisporum. Race 1 was pathogenic to L. luteus and some cultivars of L. albus but non-pathogenic to L. angustifolius. Race 2 was pathogenic to L. luteus and possibly all cultivars of L. albus but non-pathogenic to L. angustifolius. Race 3 was pathogenic to L. angustifoliusand L. albus but non-pathogenic to L. luteus. 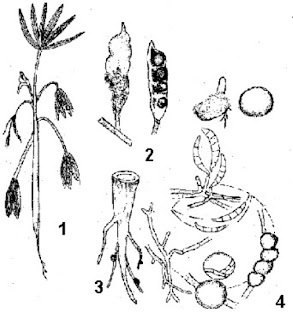 All three races – of F. oxysporum f. lupini in Europe - were specific to lupins. Fusarium wilt pathogens from cowpea and cotton in the USA were pathogenic to some L. luteus cultivars (Armstrong and Armstrong 1964). The specificity of the pathogen means that crop rotation is an effective management strategy, and it is widely adopted in eastern Europe (Sweetingham et al, 1998). As to fusarium root rot, this disease basically causes miscellaneous decays of plants. In publications, the links between fusarium root rot and nematodes were reported (Кривченко и др. 1975). With a severe course of the disease, the shoots perish. Root decay is caused more often by F. oxisporum. Conidia are colorless, crescent, with 3-5 dividing walls and a well-expressed stalk. The size of the conidia with 3 dividing walls is 28-52 x 3-4 Mk, and of those with 5 dividing walls is 46-60 x 4-6 Mk. Microconidia and special spores are absent. In this case, the leaves and stem turn yellow and wither at lupin. The radicles remain healthy. After rainfall, such plants become covered with a colorless mycelium. On these mycelia, a crescent macroconidium of the agent is developed; it has 3-5 partitions, and a size of 20-50 x 3-5 Mk. Microconidia are cylindrical, oblong, and colorless. In the cycle of F. oxysporum, chlamydospores are derived. They are spherical, one- or two-celled, colorless or light yellow. The agent of fusarium root rot survives winter in the seed or in the soil, on affected plant residues. Yellow and white lupins are more resistant to fusarium root rot, than narrow-leafed one. Methods of breeding lupin forms resistant to these diseases and recommendations concerning breeding sources are presented in the section « Lupin breeding ». Root decay or dwarfism (Thielaviopsis basicola Ferr.). The agent belongs to the class of Deuteromycetes, order - Moniliales, fam. - Dematiaceae. In Russia, this disease is observed annually. Harmful disease factors include decay and loss of shoots prior to their emergence on the soil surface. White lupin suffers from root decay more than other species. The affected plants remain undersized and dwarfish. The root system turns black and dies; frequently the stem base is affected. The disease can be spread on the stem as brown bands, then the leaves and stem turn yellow. Sporification of the fungus covers the injured places with white farinaceous coating that later becomes brown. Macroconidia are cylindrical, truncate in a polarized way, colorless, 10-27 x 3-7 Mk in size. They are developed on conidiophores (Fig. 42). Later, in the cycle of development, short chains of dark brown spherical chlamydospores with a diameter of 10-12 Mk are derived. With the help of chlamydospores, the fungus spends the winter on affected plant residues. Disease development is urged by increased temperatures in combination with an unstable water regime in soil, and “shelling” appears during the occurrence of shoots. Fig. 42. Thielaviopsis basicola Ferr. Verticillum wilt (Verticillium alboatrum Reinke et Berth.). The agent belongs to the class of Deuteromycetes, order Moniliales. In recent years, the disease has widely spread and caused considerable loss in lupin yield. The disease is manifested by fast withering of plants. Less susceptible forms of lupin resist the pathogen, which is expressed by slower development of pathological process accompanied at first by yellowing, browning and withering of leaves. Withering takes place owing to the blockage of main conductive vessels in a plant by the mycelium of the fungus, that impedes the inflow of water and nutrients. Besides, the plant is inhibited by toxic products of the pathogen’s metabolism. The mycelium of a fungal pathogen can penetrate the vessels of the host and cause choking depression of the plant. A characteristic feature of this disease is the presence of a quite visible ring of the darkened vessels on the stem cross-section. In wet environments, the mycellium and sporification of the fungus occur on the affected parts. Conidiophores are verticilate-ramified, dark-colored at the base and more light on the top. Spores are apical, ovate-oblong, and colorless at first but later grayish-brown, 2.8-12 x 1.4-3 Mk in size. The pathogen on affected plant residues survives in the form of microsclerotia and chlamydospores. Fig. 42. Thielaviopsis basicola Ferr. 1 - External characteristics of root decay development on lupin; 2 - conidiophores of the fungus with a chain of endoconidia; 3 - chlamydospores; 4 - biotic cycle of the agent’s development. Tomentose disease of lupin (Hypochnus solani Prill, et Del.). The agent belongs to the class of Basidiomycetes, order Hymenomycetales, fam. Thelephoraceae. The disease occasionally affects lupin in rainy years. When contaminated by the agent, the leaves turn yellow, and the plant may wither. These diseases lead to the exhaustion of lupin plants, although they, as a rule, may recover and produce a seed yield, while their fodder qualities are restored. The disease is manifested by white-colored coating of the stem base. The coating is composed of the mycelium. In damp weather or on humid sites, basidiospores, 7-15 x 4-8 Mk in size, are formed. In the cycle of development, a sclerotium phase is possible. The agent spends the winter in soil or on affected plant residues. In spring, when the conditions become optimal for the fungus, the pathogen infects susceptible plants. With this fungus, there is no specialization concerning the plant hosts. The pathogen may cause pathological processes in potato as well. Powdery mildew (Erysiphe communis Grev. f. lupini Roum.). The agent belongs to the class of Ascomycetes, order - Erysiphales, fam.-Erysiphaceae. This disease is widespread in all parts of Russia with annual incidence. Higher incidence of the disease is observed in dry years on open sites. Susceptible to this disease are L. angustifolius L. and L. luteusL. Pathogenic effect is manifested by pre-scheduled falling of the affected leaves and results in harvest losses. In spring, ascospores are diffused from the asci and infect healthy plants. In the beginning, the leaves and, with more severe manifestation of the disease, the stems are covered with white weblike coating, subsequently vanishing, which is formed by mycelium and conidia, 30-40 x 15-24 Mk in size. Later, in the infested areas, dot black fruiting bodies – cleistocarps are built up, with the help of which the fungus endures the winter. Cleistocarps are spherical, IOO-I65 Mk in diameter. Inside of the fruiting body there are 4-8 asci with ascospores. Each ascus contains 3-6 spores sized 17-25 x 9-14 Mk (Fig. 43 ). Fig. 43. 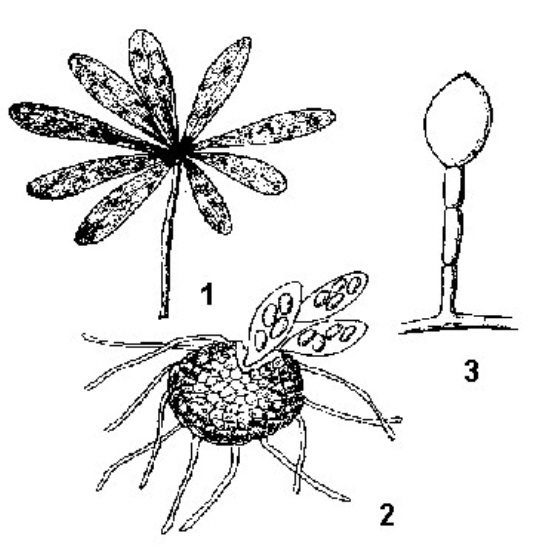 Powdery mildew (Erysiphe communis f. lupini) 1 - signs of the infection on leaflets; 2 – fruiting body of the fungus, cleistocarp, inside which there are asci with spores; 3 - conidiophore with conidia (type Pseudocium). Gray mold (Botrytis cinerea Fr.). The agent belongs to the class ofDeuteromycetes, order – Moniliales. This disease is widely spread everywhere, but the greatest incidence is marked in Russia and in the Ukraine in July/August, especially in humid years and when lupin is cultivated on humid sites. Harm from gray mold is expressed in the loss of the number of shoots, thinning of the crop, withering and drying of more adult plants, decay of pods, molding of grain during storage, and decrease of seed sowing qualities. The degree of gray mold harmfulness depends on weather conditions and maturity of lupin, on the level of susceptibility of a lupin variety, and on other factors. The sprouting seeds, shoots, stem, inflorescences and flowers are attacked by the agent, and a dark-gray fluffy coating is formed on them. In the phases of budding of flowers and flowering, gray decay strikes the root system and causes drying of the stems. By the end of the phase of green pods, the disease spreads up to the top of the stem and to the pods, whence the mycelium of the fungus dives inside and infects seeds which can also be infested during storage. The affected organs are emolliated, and after that dry up (Fig. 44 ). The coating produced by this fungus is composed of upright and tree-like ramified conidiophores and spherical unicellular conidia, colorless or smoky, 9-20 x 6-I0 Mk in size, gathered in clusters. With the help of conidia, the fungus is dispersed and infects healthy plants. By the end of the vegetation period (by autumn), when the temperature is lower than 12°C, sclerotia of various shape and size are developed. Wintering of the pathogen goes on in the affected vegetative residues or directly in the soil. Germination of sclerotia with formation of conidial sporification occurs in spring. Fig. 44. 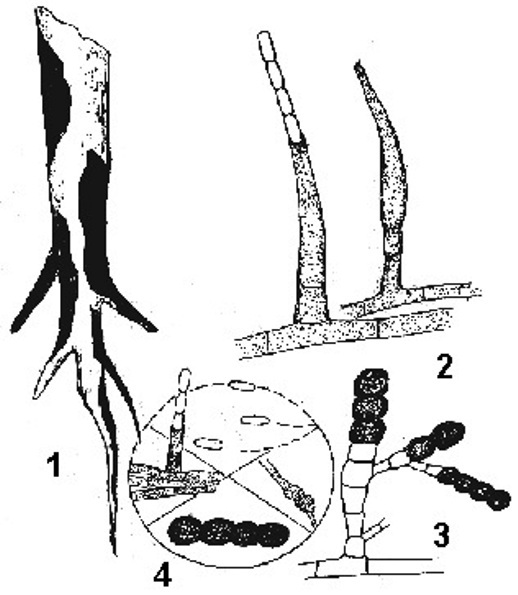 Gray mold (Botrytis cinerea) 1 - plants with the traces of gray mold and generic sclerotia; 2 – tree-like ramified conidiophore with the heads of twisted conidia; 3 - mycelium and crossection of the sclerotium of the fungus. The agent is more specialized toward yellow fodder lupin, and less to narrow-leafed and white forms. Sources of gray mold contamination are the affected seeds, weeds, vegetative residues of lupin and other plants in soil. Affected seeds frequently perish or produce weak shoots, on which sporification of the fungus copiously develops. There are two types of contamination of lupin seed by B. cinerea: surface contamination, when conidia, parts of the mycelium, or sclerotia are on the surface of the seed, and deep contamination, when the mycelium of the fungus penetrates through the hull into the seed. Phomopsis (Phomopsis leptostromifornie (Kuohn.) Bubak or Diaporthe toxica Williamson. The agent is referred to the class of Deuteromycetes, order Sphaeropsidales, fam. Sphaerioidaceae. Maculation of lupin stems or drying of stems, occurring in some years, leads to a decrease in the yield up to 40%. The diseased plants lag behind in growth (development), and the absolute seed weight is decreased. Affected plants are subject to premature death. On stems and branches, the disease is manifested as spots of yellow color. Black cushions of the fungus arranged by series are formed on them. Inside these cushions, cavities with openings (pycnidia) are developed, with colorless cylindrical unicellular pycnospores, 5-10 x 1,5-2,5 Mk in size (Fig. 45). 1 - general picture of the disease; 2 – conidiocarpic sporification of the fungus; 3 - ascus with ascospores of the pathogen. The fungus spends the winter mainly in the stage of pycnidia in the affected vegetative residues. In the spring, pycnidia would disseminate pycnospores, by which the fungus contaminates susceptible plants. In the cycle of disease development, the ascus stage is reported to be present. The asci are elongated, spores in the ascus (ascospores) are light yellow, 16-19 x 5-8 Mk in size. Infection of lupins by P. leptostromiformis may result in mycotoxicosis that can destroy livestock grazing stubbles (Sweetingham et al, 1998). It has been a major problem for crop mixtures and livestock farms in Australia and South Africa (Sweetingham et al, 1998). Based on distinct morphological and biochemical characteristics, Williamson et al. (1994) selected a new species name for the teleomorph (Diaporthe toxica), leaving the name P. leptostromiformis for the anamorph in doubt. Under Australian conditions, D. toxica over-summers on colonized stubble as both perithecia and pycnidia contained in dark spherical stromata (up to 3 mm in diameter). Ascospores are wind dispersed early in the winter along with rain-splashed conidiospores (Sweetingham et al, 1998). 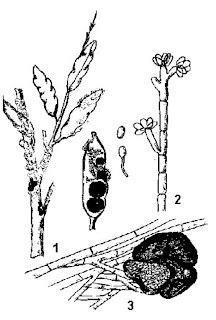 The fungus remains viable in woody stem frag­ments for at least two years (Wood and McLean, 1982). Winter and spring infection can be accelerated by secondary conidiospore production on prematurely senescent and defoliated leaflets (Brown, 1984). The fungus has been reported as a stem pathogen in Europe (Kochman and Kubika, 1974) and as causing significant damage in green L. luteus in south-eastern USA (Ostazeski and Wells, I960). Resistance offers the only practical control for D. toxica. It reduces the risk of lupinosis and seed discoloration. Under Australian conditions, L. albus cvs. Ultra and Kiev Mutant have a good level of resistance. The first resistant form of L. angustifolius was cv. Gunguru. 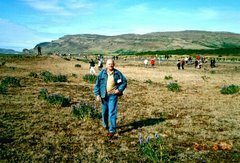 It carried resistance from wild lupins collected from the western Mediterranean region (Gladstones, 1989, Sweetingham et al, 1998). Kochman and Kubika (1974) found that L. luteus was the most susceptible species in Poland. In South Africa a range of L. albus were more susceptible than L. luteus, while a L. mutabilis line was the resistant species (Van Jaarsveld and Knox-Davies, 1974). Sclerotinia, or white decay of lupin (Sclerotinia sclerotiorum (Lib.) de Bary and Sclerotinia. Minor Det.). The agent belongs to the class ofAscomycetes, order Helotiales, fam. Sclerotlniaceae. It is a harmful disease of lupin that can be found everywhere. The disease develops in a focal fashion and notably reduces the yield of green matter and seed. Susceptibility of plants is augmented by insect depredation and unfavorable factors of development. The first signs of sclerotinia turn out on lupin in mid-summer. At the foot of the stem, a sodden colorless spot appears, which would be covered in rainy weather by white woolly coating consisted of the mycelium of the pathogen. The spot can spread up along the stem and round it. An infected plant withers; its leaves lose turgor, shrink and dry up. By fall, the mycelium becomes dense , and sclerotia of different shape and size are derived on it. The surface of the sclerotia is covered by husk (looking similar to pod shell), the core is formed from densely entangled mycelium. With the help of sclerotia, the fungus survives the winter in soil and on plant residues, and occurs in seed as impurity. In the spring, sclerotia germinate and produce the fruiting body - apothecium. Set on a long stalk, it is small-sized and white-brown, with a recess in the center. On the top of the cap, the asci are set, with 8 ascospores in each ascus. Development of apothecium requires physiological maturity of sclerotia, warmth, moisture and indirect illumination. In the cycle of development of sclerotinia, there is a conidium (parasitic) phase. The fungus is distributed by ascospores and mycelium. The disease virulence is higher in rainy weather. Macrosporiosis of lupin (Macrosporium sp.). The agent is attributed to the class of Deuteromycetes, order Moniliales. The disease occurs infrequently, in some years, in the second half of the summer season. The harm caused is minor, however in humid years the disease can be intensified, and lead to the drying-up of diseased leaflets. Attacked are the leaflets of the lower circle where a small-sized (1-3 mm in diameter) round spot is formed, brown in the beginning. In due course, the middle of a leaf turns yellow and pigmented. The most severely affected leaflets fall down. Plant susceptibility increases when the plants are poorly maintained. In wet weather, olive conidial sporification occurs on such spots. Conidia are single, the back one mace-like, with bright brown coloring, 25-82 x 5-12 Mk in size, with transversal and longitudinal partitions. The conidia provide for the yearly activity of the pathogen and contamination of new plants. The cycle of development of the fungus includes false sclerotium, with the help of which the fungus spends the winter. The zymotic source is preserved in affected vegetative residues. The fungus has narrow specialization toward yellow lupin, while the other species are resistant against this agent. Helminthosporiosis of lupin (Helminthosporium rhopaloides Fres.) The agent belongs to the class of Deuteromycetes, order Moniliales, fam.Dematiaceae. The disease occurs infrequently; in the plantings of collection accessions it was observed only with yellow lupin. The disease predominantly attacks leaflets. A spot consists of dark brown strips. In damp weather, it is possible to observe sporification of the pathogen as grayish-brown coating composed of conidiophores, and dark-brown conidia with partitions, 36-70 x 6,5-11 Mk in size. The pathogen is spread by means of conidia, thus contaminating healthy plants. The agent spends the winter as false sclerotium, which is set up in the tissues of an infected plant. In the spring, the false sclerotium is developed into conidia, which cause primary contamination of susceptible lupin forms. Stemphhylium, or grey spot of leaflets, stems and pods (Stemphhylium sarcinaeforme Wiltsh.). The agent belongs to the class ofDeuteromycetes, order Moniliales, fam. Dematiaceae. The disease is particularly widespread in humid years. By the beginning of the summer season, the leaflets of the lower circle display a round spot, up to 4 mm in diameter, its color varied from gray to dark–brown. The disease develops quickly, resulting in deformation of the affected leaflets. Then the disease is transferred onto stems and pods, where initially a single dark gray spot occurs. In the course of time, the stem may crack, and the beans are not knotted. From pods the disease passes over to seed, which become sick and lose germination ability. The diseased susceptible lupin samples derive a dark-olive coating made up of mycelium, conidiophores and conidia of this fungus. The latter have a peculiar, almost rectangular shape, being smoothly dark-brown, with several transversal and longitudinal partitions, 15-45 x 10-25 Mk in size. The conidium phase is parasitic, and serves for distribution and contamination of healthy plants. The fungus survives the winter in the affected plant tissues as false sclerotium, consisting of mycelium. The infection may be preserved in seed. Susceptible to this disease are narrow-leafed lupin and clover. Yellow and white lupins possess immunity against this disease. Ceratophorum (Ceratophorum setosus Kirohn.). The agent is attributed to the class of Deuteromycetes, order Moniliales (syn.. Mastigosporium lupiniCav., Pestalotia lupini Sor.) This disease is not widely spread. However, if strongly developed, it does great harm to the lupin crop, affecting leaflets, stems, pods and seeds. The leaflets of susceptible forms of lupin, when infected, show large black-brown spots with bordering, and the leaflets dry up. On the stem, the disease develops in the lower part, and then passes on to the middle and upper parts. From the pod the disease passes over to the seeds. On older organs, conidial sporiparity may occur. Conidia are spindle-like, 72-90 x 12-19 Mk in size, with several partitions. On the top, the spores bear a number of colorless protuberances. Within one summer, the agent is dispersed by conidia and provokes new contamination of healthy plants. On the mycelia, chlamydospores of the fungus are formed. Their color is at first yellowish, and later grayish.. The pathogen spends the winter as conidia and chlamydospores on affected vegetative residues, and also on seeds. The agent of ceratophorum is more specialized to white lupin samples. Septoria, or white maculation (Septoria lupini Kazn.). The agent belongs to the class of Deuteromycetes, order Sphaeropsidales. Developed to a strong degree, this disease can degrade fodder qualities, reduce the yield of green matter, and lessen the absolute seed weight. The disease spreads during damp years. In the spring, the leaflets of the lower and middle circles acquire an abnormally round brown spot, 1-4 mm in diameter, the central part of it being white and the borders dark-brown. In the course of time, on such spot fruiting body of the fungus is formed (pycnidia). They are black, spherical, 100-200 Mk in diameter. Inside the pycnidia there are pycnidiospores, threadlike straight or curved lines, colorless, with partitions, 40-120 x 3-4 Mk in size. They cause vernal contamination of plants. The fungus spends the winter in the form of pycnidia on affected plant bodies of lupin in soil. The disease develops on yellow lupin more readily. Narrow-leafed and white lupins are resistant to Septoria lupini Kazn. Virus of the mosaic of alfalfa (Alfalfa mosaic virus), and others. Bean yellow mosaic virus (BYMV) is the most harmful virus disease of lupins worldwide. Symptoms of current-season infection with BYMV by vector aphids vary between lupin species (Sweettingham et al, 1998). InL.luteus narrowing of leaflets, pallor, vein clearing and faint mosaic develop on young leaves. Leaflets tend to fold along the midrib and are held at an acute angle, giving an upright appearance. Mature leaves develop vein clearing or remain unaffected (Norris, 1943). In L. albus, vein clearing is first noticed in the youngest leaves. Then, as infection spreads through the plant, severe mottle, leaf deformation, defoliation and stunting follow. Early infected plants may die (Corbett, 1955). In L. atlanticus, L. pilosus and L. cosentinii, symptoms resemble those in L. albus but tend to be less severe (Norris, 1943; Jones and McLean, 1989; Sweettingham et al, 1998). In L. mutabilis, symptom severity varies but may be little more than vein clearing and mottle (Eppler et al., 1986). In L. angustifolius, necrotic streaking develops on the youngest portion of the shoot, which then bends over, producing a characteristic «shepherd's crook». The growing tip dies and necrosis spreads, blackening the stem and killing the plant. In older plants the virus may remain localized in some branches, producing similar necrosis and blackening but without the «shepherd's crook». When infection occurs after pod set, tips of affected shoots die and pods blacken and fail to fill ((Frencel,1988; Golovchenko, 1994; Sweettingham et al, 1998). Cucumber mosaic virus (CMV) infect mainly L. angustifolius and L. luteus. However, according to Jones and Lattiam (1996), this virus does not infect L. albus, L. cosentinii, L. pilosus or L. atlanticus, but can infect L. mutabilis. Current-season infection of L. luteus by aphid vectors results in chlorosis, faint mottle, bunching and downcurling of young leaves, reduction in leaf size and brown streaking of the stem. Late infection may result in little more than chlorosis of the youngest leaves (Sweettingham et al, 1998). With L. angustifolius symptoms are similar but somewhat less severe and without stem streaking (Frencel and Pospieszny, 1983; Jones, 1988; Jones and McLean, 1989). CMV is transmitted non-persistently by aphids and is seed-borne in L. luteus (Zchau, 1960) and in L. angustifolius(Jones, 1988), which accounts for the importance of the virus in these two species. More detailed information about virus diseases of lupin in Russia, Belarus and the Ukraine is presented in the section about initial material for breeding. Blackness of stems - Erwinia phytophthora (Appel) Bergey et al. Decay of plantlets (in seed) - Pseudomonas xanthochlora (Schuster) Stapp. Bacterial wilt of plants - Pseudomonas solanacearum (E. F.. Sm.) Bergey. Lupin-root weevil is the most dangerous among the pests of lupin in Russia. It is the largest of all of them, its size reaching 9 mm. Lupin-root weevil damages all species of lupin, with a preference, however, to the long-term Washington lupin where it not only feeds, but also multiplies. Lupin-roor weevil is covered with scales which are present even on its jaws. Its color depends on the color of scales. Its abdomen is usually silvery, while the elytra are more often gray. Oblong light scales on the scutellum are arranged in a stellate pattern. 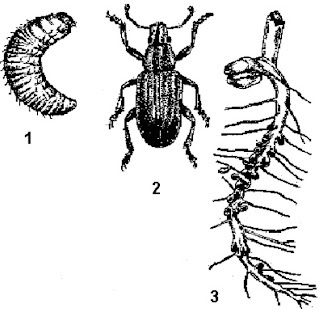 The paws, similarly to all root weevils, are equipped with suckers which exude sticking liquid. It is possible to descry lupin-root weevils on crops by typical injuries of leaves (indents on their edges). Larvae injure root nodules at lupins (Fig. 46). 1 - larva; 2 - bug; 3 – lupin root nodules injured by larvae (two top nodules are healthy, while all nodules below are injured). All weevils have a phase-by-phase cycle of development. This insect lays eggs in soil or on lupin leaves. The eggs are light-colored, but soon they would darken and become black. The larvae issuing from the eggs are white, apodial, curved, 4 – 8 mm long. At once, they disappear underground and penetrate into the root nodules. They would transform into chrysalis in soil. The new progeny of the bugs comes out from the chrysalis in mid-July or early August. In one year, weevils produce only one breed. Young bugs demand more food and spend the winter on plants. Lupin-root weevil sometimes spends the winter on broom-grass and melilot. Banded and setaceous weevils are wintering on clover and some other perennial leguminous plants. Aphids (Aphis sp.). Aphids cause damage to different organs of lupin and serve as vectors of virus diseases. In Russia, they appear on the crop at the end of the first decade or the middle of the second decade of June. At first, the insects set themselves in the vicinity of the apical bud, and afterwards they occupy the whole plant. Aphids consume sap, so, as a result, the leaflets of lupin curl, the stem bends, the plane growth process becomes delayed, and the fodder qualities are degraded. Most favorable conditions for aphids show up in thinned plantings. Insects are much fewer or frequently completely absent in plantings with uniform crowdedness. During the vegetation period of lupin, an aphid can produce from 4 up to 10 progenies. A female aphid lays eggs (one or more) at the foot of the stem. Here the eggs spend the winter. In the springtime, the larvae emerge from the eggs. In the course of time, they transform into female insects to give birth to a new generation. Fig. 46. Lupin-root weevil (Sitona sp.) 1 - larva; 2 - bug; 3 – lupin root nodules injured by larvae (two top nodules are healthy, while all nodules below are injured). Thrips. Various species of thrips colonize the youngest plants of lupin at the flowering phase. They feed off and may cause damage to flower buds, leaflets, and also pods. Interactions in the host-pathogen system are conditioned adaptively and regulated generically. 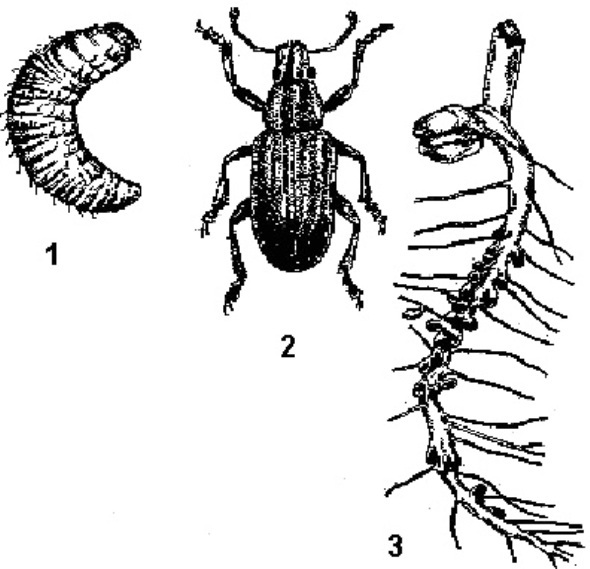 The evolution of parasitism went from saprophytic feed to parasitic one. For heterotrophic organisms, saprophytism is replaced by optional parasitism, optional saprophitism and mandatory parasitism. The strengthening of pathogenicity at the initial stages of the co-evolution results in resistance mutations in the host population, the effect of which may be subdued by virulence-oriented selection of the pathogen. So, cultivation of a low-virulence form of Fusarium oxysporumin the presence of gradually increasing concentration of root emergence in a resistant variety leads to strengthening of pathogenicity, and the strain becomes virulent for the resistant variety. Such mechanism creates variation of resistance in the host and variation of pathogenicity in the pathogen, and lies at the basis of modern concepts concerning resistance (immunity) types. It is assumed that phylogenetically conditioned resistance is expressed in two ways: as common resistance, i.e. non-specific to pathogenic spectrum, or horizontal, and as race-specific resistance, or vertical. The first of them is controlled, as a rule, polygenetically. This type of resistance is more stable in terms of time and space, however it does not provide full protection of the host plant, only lessening the effect of infections, necroses, coatings, pustules, sporification of an agent, etc. A special case of horizontal resistance is tolerance, that is biological self-adaptivity of the host to rather heavy pressure of the pathogen without proportional qualitative and quantitative yield decrease. Tolerance is obviously the most ancient way of interactions in the host-pathogen co-evolution, and deserves close consideration by experts. The second type of resistance is specific. It provides full protection against a definite race or species of a pathogen, but does not resist other races and species of this pathogen. It is controlled by the oligogenes of vertical resistance, and is inherited qualitatively. However this resistance, causing selective pressure on the pathogen, is overpowered by changes in the structure of the population, by building up forms with complementary genes of virulence. In this case, the fewer genes of race-specific resistance are involved in selection, the faster will be the process of subduing the resistance. Resistance of plants to pests involves two generally independent components: non-affectability and suppression of damages (Чекалин et al., 1981). With non-affectability, in its turn, it seems also reasonable to discern two aspects: preference (non-preference) and antibiosis, or resistance in a narrow sense. These two components are not necessarily interdependent in each separate case, although, in general, the accordance between them exists: the population of phytophages, by choosing an irrelevant substratum, is doomed. Components of resistance, as well as plant properties, are correlated with the properties of the population of an insect. Preference is linked with selectivity, antibiosis with the fitness of an insect to the given variety evaluated, for example, by its survival rate; the plant’s ability to suppress damage corresponds to the harmfulness of an insect. Thus, estimation of resistance, in a broader sense, can or should incorporate a number of parameters describing the reaction of a plant, which is more exact than a crop, to damage, the response of an insect population to the given host sample, and, finally, their interaction. Natural populations of diseases agents are produced by an unlimited number of races, strains and species with different pathogenicity and virulence. For breeding purposes, it is frequently necessary to create synthetic populations, so that authentic estimation of resistance could be made by means of synthetic contamination. The degree of pathogenicity of geographic forms, strains and races should be determined by testing the sets of differentiator varieties which differ by the type of their response to contamination by different agent isolates. Today’s priority for lupin is to make up test sets based on their genetic nature, i.e. monogenic lines (differentiators) capable to test definite immunity-inducing genes characterize their efficiency. · Immunological characterization of a gene pool applying synthetic contamination, and identification of potential resistance sources. · Testing donor properties of resistance sources during hybridization, and identification of genetic factors determining resistance. · Utilization of resistance donors with identified genes of race-specific vertical and horizontal resistance in breeding programs. · Maintenance of disease and pest resistance in commercial lupin cultivars at a satisfactory level by using immunological control in the links of primary seed production and breeding enhancement. The analysis of resistance is usually carried out on infectious backgrounds or by synthetic contamination of plants. A natural infectious background is applied where epidemics are reported almost annually. In this case, a 2- or 3-year test makes it possible, with high degree of veracity, to identify the initial forms, most valuable in terms of resistance. For effective synthetic contamination, it is necessary to create favorable conditions for diseases and make contamination of the host plant in a vulnerable phase. The process of contamination starts with spore germination of the pathogen on the surface of a plants and infiltration inside the tissues. Some pathogenic fungi (agents of rust) penetrate by tubes through stomata; other species actively perforate the cuticle (powdery mildew) or pervade through wounds (agents of ascohyta lupinicola, botrytis, fusarium). Obligate parasites usually feed on living cells, and the agent can develop either inside plant tissues or the surface of the plant (powdery mildew). Facultative saprophytes and parasites make their feed with the help of toxic for the vegetative tissue ferments. The agent’s intrusion process ends with the appearance of external signs of the disease. The time interval required for this process is called an incubation period of the disease, its duration sometimes marking the resistance of this or that sample (incubation resistance). Later, vegetative development of the pathogen is observed as well as the formation of its reproductive organs by which it is dispersed (secondary contamination). At the initial stage (intrusion of a pathogen), plant resistance is determined by morphological features of cover tissues (thickness of the cuticle, composition of epidermal cells), and phitoncidic or challenging effect of their manifestations, i.e. by nonspecific reaction of plants. Identification of resistant forms by applying synthetic contamination or infectious background (for pathogens affecting the root and vascular system of plants) is more frequently carried out in field conditions. However, in this case it appears difficult to provide and maintain temperature and moisture levels optimal for contamination. It seems easier to do this in glasshouses and laboratory, provided that such experimental data sufficiently correlate with the results obtained in the field. Correlation between the degree of resistance of grain legume samples in field conditions and the degree of their resistance in glasshouse and laboratory conditions to the pathogens with narrow specialization is high enough (correlation ratio: 0.66 – 0.90). Nevertheless, the results of synthetic contamination in the glasshouse and those of laboratory experiments should be regarded as supplementary. The forms identified as resistant ones during the contamination in a glasshouse or in laboratory conditions are to be tested by synthetic contamination in the field. Infectious background is created by inoculating plants (spraying, pollinating, or injection) with a natural population, or a mixture of geographic forms, or clean pathogenic cultures. More often contamination is performed by means of synthetic populations, i.e. by an arbitrary mixture of most pathogenic and virulent forms or separate isolates (races). It helps, especially during glasshouse and lab tests, to study horizontal, and race-specific vertical resistance. Reproduction of zymotic material of obligate parasites proceeds on living plants of susceptible varieties planted isolated in the field or in the glasshouse. Contamination of different fungi is performed by applying freshly collected conidia and ascospores, by uredospores, or by conidiospores or oospores. Synthetic contamination of plants by one virus (mosaic of lupins) is implemented by mechanical rubbing the sap of diseased plants. If other viruses are needed to be applied, special insects are used. In order to set up a synthetic contagious background of soil-dwelling disease agents (Fusarium, Pythium, Sclerotinium, Rhizoctonia) in field conditions, the method of a one-crop system of the host plant is being applied on a special site for a number of years. Building up an infection and respective decrease of the number of antagonists are also reached by synthetic contamination of soil, depositing vegetative residues or soil from the sites where epidemics was observed. At the time of sowing and two or three times during vegetation, clean culture of the pathogen multiplied in sterile media is introduced. This technique is used not only with soil-dwelling fungi, bacteria and nematodes, but also for wintering of facultative saprophytes and parasites, as well as obligate parasites, for example Erysiphe, Peronospora (ascus or oospore stage). In vegetative and laboratory tests, sterilized soil is blended before planting with a clean culture of the agent (Fusarium) multiplied on sterile seeds of oats or the host plant. Another way of effective contamination is soaking the shoots with injured roots in the homogenate of clean pathogenic culture for one hour before sowing the seeds in vegetation vessels or boxes filled with sterile soil. Phytopathological assessment of plant damage is based on visual or instrumental techniques of recording plant reaction (qualitative scale) or the intensity of the affection (quantitative scale). Evaluation of plant response is usually made with an interval equal to two or three incubation periods of the disease after contamination. Generally, the basic character in the process of registration and selection is depression of plants. The basis for effective selection of potential resistance sources is the knowledge of the genetic system of the host-pathogen interaction. Phenotypic development of resistance is determined by the genetic factors. Distinguished are main or major genes with large effect, and minor genes producing gentle effect. Inheritance of major genes is easily identified in descendants, however they more often determine particular resistance to a definite race or group of races. Phenotypic effect of minor genes depends on their quantity, which determines the level of nonspecific resistance inherited quantitatively with polymer cleavage. Some researchers have reached the conclusion that the concepts of horizontal and vertical resistance have no genetic contents, as the genes determining resistance are the same, but their manifestation varies depending on the genetic background of accessions. Their effect provides vertical resistance, if the genes are disconnected; and horizontal, if the genes are coupled in one genotype (Чекалин et al., 1981). Thus, the characters causing resistance to diseases and pests often show not only as qualitative but also as quantitative. They, as a rule, difficultly give in to detailed learning. Quantitative characters are in most cases formed and undergo changes during a certain period of development, in the process of ontogenesis, depending on the time, effect and properties of the limiting factors. This question is considered in more detail in the section « Genetics of quantitative characters». In particular, when analyzing the nature of the inheritance of resistance to Fusarium Lk. in yellow lupin, it was initially established that the resistance character was monogenic, dominant and indicated by the term Fus 1 (Hackbarth, 1957a; Gladstones, 1970). However subsequent researches (Лукашевич, 1980, 1981; Хотылева and Савченко, 1988; Курлович et al., 1990) have revealed more composite nature of inheriting this property, as the agent (Fusarium Lk.) is respresented by a large number of species, strains and races. In view of this, depending on the genesis of the initial maternal forms, the nature of the inheritance of the resistance character in hybrids can be both dominant and recessive. Besides, it can be controlled by various quantities of genes. According to Lukashevich (Лукашевич, 1980, 1981), for cvs. Cyt, Refusa Nova, Borluta, the resistance is controlled by recessive genes, and for cvs. Afus, LLU-17537, by dominant ones. As field resistance provides only partial protection of plants, but is effective to all pathogenic forms of the agent, the latter overcomes it only during epidemics under as favorable conditions for development and reproduction as possible. In this case, special importance is acquired by tolerance, i.e. endurance of plants against a sufficiently high zymotic background of a pathogen. It is considered that tolerance-controlling mechanisms are provided by the whole genetic and physiological system of the host and polygene inheritance. Tolerance is evaluated as regression of a crop on the level of disease development or damage inflicted by pests. Regression is assessed by comparing the crop on an infectious background with the reference sample treated by fungicides or insecticides. Characters of pest resistance. Sometimes it is possible to find anatomical, morphological, physiological or biochemical character accountable for resistance. It makes subsequent selection activities considerably easier. Nevertheless, harmonization of a genotype is considered a relevant part of the breeding ideal and has significance beyond the problem of tolerance to damages. In a number of cases, the resistance is connected with the content of alkaloids in lupin, as a factor of immunity to aphids and other pests (Чекалин et al., 1981). Giebel (1974) indicated the presence of non-activated glycosides as a factor of immunity to nematodes. However, in many cases immunity should be evaluated only directly, and the analysis of inheritance of this character can point out an applicable selection technique. For self-pollinating plants, to which some of the lupin species belong (L. angustifolius), intraspecific varietal selection for diseases and pest resistance is limited and unproductive, owing to high homozygosis. But selection on an infected background is possible for local or old landraces and introduced heterogeneous populations. Selection of resistant genotypes is possible for many species of lupin with optional self-pollinating ability. Spontaneous hybrid forms from inbred lines can provide at individual selection valuable resistant types at species with optional self-pollinating ability. The basic techniques of enriching the gene pool of resistant forms are intraspecific and remote hybridization. With monogenic recessive inheritance, selection of resistant phenotypes becomes effective already in the second generation. In splitting populations, with dominant monogenic inheritance, selection of resistant phenotypes is carried out in the third, fourth and fifth generations to retain as many genotypes with other valuable traits as possible. In order to maintain the concentration of genes in one genotype, especially during remote hybridization and polygenic inheritance of resistance, backcrosses among themselves or among inbred lines are performed. Hybridization of different by origin forms usually provides a broad range of hybrid forms on the level of resistance to pathogens. Therefore, the volume of investigated materials is strongly increased. In order to make correct assessment and selection of the most valuable genotypes, it is necessary to have clear awareness of which type of resistance is required (non-specific horizontal or race-specific vertical). The interspecific hybridization gives routinely wide spectrum of hybrid forms with increased stability to pathogens. Therefore this direction of research has major perspectives (Чекалин et al., 1981). From: vir@vir.nw.ruMister BK. It is possible to create lupins cultivar with resistance to an anthracnose? Your question is very interesting!It is necessary to find an initial material even with an attribute of tolerance for the beginning. Tolerant forms are expedient for crossing among themselves for intensifying stability, accumulating in genotype valuable genes. We managed to solve the problem of stability to fusarium by similar mean (Kurlovich, B.S. 1990). The hybrid progeny may comprise transgressive forms, i.e. the forms with an increased or decreased value of the character when crossing parents with different types of variability. Differentiation in the variability of characters in parental forms can be found by testing them under different conditions using, however, the same techniques. With the help of this method, it is possible to obtain valuable transgressive forms with regard to any characters, from chemical structure to disease resistance (Kurlovich et. al., 1995). Lupin cultivars and lines (547 accessions) were tested for Fusarium resistance under different environmental conditions of two regions in Russia (near Bryansk and St. Petersburg), and in the Ukraine (near Kiev) on plots with artificially infested soil. A large number of accessions of different lupin species were selected for their resistance manifested on a single plot with infested soil. On two other plots, they were susceptible. So, differences in disease susceptibility in the same accessions were found in contrasting environments. Resistant forms selected in one region were crossed with accessions that showed resistance in two other regions. As a result of hybridization, two transgressive resistant forms were obtained in F4 : from the crosses cv. Frost x cv. Apendrilon (Lupinus angustifolius L.), and line G-413 x line 85 (Lupinus luteus L.). Their resistance in all three regions appeared to be higher than in their parental forms. These two transgressive forms with increased resistance to Fusarium wilt were found suitable for the breeding program on Fusarium resistance in Russia, Belarus and in the Ukraine. I am optimist! The problem of anthracnose also will be solved in the future! What do you thinking about a problem of anthracnose at lupins? However, I offer concrete ways of creations tolerant forms to this disease (step by step). It is necessary to cross among themselves the forms showing tolerance to this disease, accumulating in the subsequent generations different genes of tolerance. It is possible to receive resistant forms in the future due to gradual amplification in genotypes of tolerance attribute to anthracnose, and by creations of transgressions. 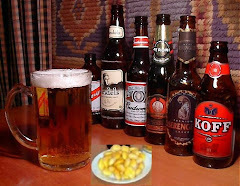 We have experience of creation of lupins forms, steady to фузариозу. It is discussed by us in the chapter: GENETICS OF LUPINS ; section: Genetics of quantitative characters. As a case study, we will discuss the method of producing transgressive forms of lupin on the basis of eco-geographical approach (Kurlovich et al., 1995). We have found out that each quantitative character has from two to five or more types of variability. This fact is very interesting. Earlier it was rarely taken into account in the system of genetic techniques. A definite character has changed in the process of cultivation in various environments almost identically in a majority of accessions. However, this character has a different type of variability in a small number of accessions when studied in different environments (different geographic locations, or different years of study on one site). It appeared that in the hybrid progeny this character was within the same limits as in the parental forms when they had identical types of variability of such character. However, the hybrid progeny may comprise transgressive forms, i.e. the forms with an increased or decreased value of the character when crossing parents with different types of variability. Differentiation in the variability of characters in parental forms can be found by testing them under different conditions using, however, the same techniques. With the help of this method, it is possible to obtain valuable transgressive forms with regard to any characters, from chemical structure to disease resistance (Kurlovich et. al., 1995). Differences in disease susceptibility in the same accessions were found in contrasting environments. Resistant forms selected in one region were crossed with accessions that showed resistance in two other regions. As a result of hybridization, two transgressive resistant forms were obtained in F4. Their resistance in all three regions appeared to be higher than in their parental forms. We thinking that this approach will be effective also with reference to anthracnose! diseases can be diverse, depending on the class of an agent and weather conditions. Would you please send me the orginal papers to report these bacterial diseases? The material is taken from the Russian publication (the Descriptor for the genus Lupinus L., The version on Russian), p.23, 1983. The scanned copy is applied. Are you still available for comments? I am working on my Ph.D at present and I would like to know whether there are microconodia in Colletotrichum spp. i would be also glad if you could give me some suggestions to induce tha formation of perithecia.thank you. is favored by temperatures between7° to 10°C. optimum temperature for ascospore discharge is 10°C. I wish you the big successes in researches! But how?? by pest control abu dhabi company offers.